One Sunday last month, I hopped a train to visit my teaching partner, Pooneh, for a trip to the annual "Making Learning Visible" Exhibit by the Artists at the Centre. I was excited to finally make the trek to Hamilton to see this work, inspired by the glimpses shared at the "Documentation as Relationship: #BECS2015 Conference at Charles Sturt University back in March. I was also still full of images and ideas from the day before, Saturday May 23rd (the post about that day, a conference featuring Ann Pelo, will be written next). I had a wonderful time with Pooneh, first at the powerful little exhibit where visiting families and educators alike were warmly greeted by Karyn Callaghan. Karyn had just returned that weekend from traveling with a group of educators on a tour of Reggio Emilia. Evidence of Reggio-inspiration was all around: beautiful invitations for the visiting children to create works of art, photos of children deeply engaged in projects, stories beautifully told by their teacher-collaborators, and most fascinating to me, a group of educators who were sitting together looking at a video and discussing the content. The video depicted a small group of toddlers or preschoolers playing with paper. They weren't sitting at a table drawing or using scissors, but instead engaged in full-body exploration of large sheets of paper. It was boisterous and joyful and messy. I was immediately drawn in (and thus also a bit embarrassed because I knew I shouldn't intrude on their sharing) by the way the teachers were critically discussing the materials, the student relationships, the way it might look to a visiting parent or other adult. Here was an example of what I'd heard and read about in Reggio Emilia preschools: teachers engaged in research, decomposing experiences together. It was entirely energizing to be there with my teaching partner, with whom I've begun a journey of co-teaching and co-learning about sharing pedagogical documentation. I have no photos of the exhibit because this was documentation of children's words and work, including names and identifying features. I have only the photos of the building facade and memories of mesmerizing photos and stories, but one can see some of the artifacts on the exhibit catalogue page. We spend a good long time poring over the photos and artifacts at the exhibit, and then headed out to Pooneh's back yard for a cup of tea and some time relaxing in the shade. As we chatted and watched wildlife scamper and fly all about on the sunny afternoon, the wave of thoughts I'd had on the train trip out that morning were long gone. look closely, and take pictures to share with the kids back in school. It wasn't until much later, when I reopened the notepad I carry with me, that I rediscovered my notes from that trip. I'd been thinking about the conference I attended the day before, and had finally the time to open the pages of Ann Pelo's latest book, "The Goodness of Rain". I was only a few pages in when the emotion of it hit me and I had to put the book down. It may have been in the book or a memory of her keynote talk from the day before, but I connected deeply with the idea of "learning all the names" of the living world around us. It was a gift from my mother that I only in adulthood saw as a gift. I dug out my notebook and a pen and I started to write. What follows is that stream of consciousness connecting of present and past and familiar and new, seeing patterns and making sense of why I'd been so inspired by outdoor educators and environmental focussed learning. I was having a realignment, a cognitive reassignment of ideas to wider areas, to charge deeper meanings, or shining light on ideas that were hiding in shadow. It was a moment of enlightenment, about my life, and my life-work. Ann Pelo's intimate and reverent story of learning to love one's living place. Why outdoors? How is this conference and this trajectory of mine a part of a "kindergarten life"? We as teachers learn a lot about teaching at our Bachelor of Education courses: literacy, numeracy, special rights or needs, organising a classroom, "classroom management" ideas, theories of education, and more. But there is little danger of this knowledge being lost. We are a literate culture, whether on a device or paper in a book, we are voracious consumers of sign and symbol. We make and consume text daily. We treat schools as places to sit and listen, look and hear, focusing on language as transmission of knowledge. Indeed, language is powerful to carry ideas and transmit to others. But language doesn't replace experience. We cannot know a child because we know their name, its only a beginning. Our senses are highly attuned to taking in information from all sides and all sources we can identify. Those of us who are thin-skinned, sensitive, distractible and yet highly-focused (sound like ADHD? I'm beginning to hate the label even though I have begun strongly to identify with it as a viable explanation of my social difficulties as a child). We have skin and nerves all over, not just in our heads. Smell is information. Sound is information. Taste is information. Sights are information. A sense of balance, a feeling of chill in the breeze, warmth of the sun on skin, or of a rock warmed by sun but now in the shade... all telling us to be mindful and pay attention to the world all around us. While it's been years since I've sat to meditate, I do try to retain a mindfulness/awareness practice in my day. Walking helps me retain my equilibrium, helps me remain very present. Riding my bike connects me to my local environment where I can see the growth and change in trees, the creek, the bird inhabitants of the forest, and feel the breeze on my skin. So, where does this fit, again, in "this kindergarten life"? My path as teacher is tied to that of my learning partners: my students over the years who've shown me the greatest growth during outdoor exploration or while reflecting indoors on outdoor memories; that of my own children, and to my new teaching partner Pooneh (who I can scarcely believe is new, as it seems we've been together for years) who also embraces outdoors as a place full of potential for our daily curriculum. An outdoor pedagogy... something I've been working towards for years now, with my involvement in the York Region Nature Collaborative (YRNC) and relationships I cultivate with an outdoor learning PLN. First of these PLN relationships has to be with the incredible Rob Ridley whose #EnviroEd chats and weekly blog posts help educators in Peel and around the world to unpack our outdoor education backpack, and to think critically about how we can do more. As I scrawl these words in a notepad, I stopped. A movement caught my eye outside the train window. A huge shape soared over - a great blue heron! It slowly crossed over the parking lot of Oakville Go Station and swooped down out of sight to the river beyond the trees. I gaped, then looked around me. No one noticed, not anyone on the ground, nor anyone on the train car I'm in. This habit of stopping everything to attend to nature unfolding before me: a smell on the breeze, a deer jumping across a the path far behind me (announced by the crashing of tree branches and snorting breaths), a bird soaring overhead or singing, unseen, in a tree nearby, a change in the wind... this habit has always made me seem "weird". As a child I learned to squelch my exuberance but not my attention; I didn't yell "chipmunk!" at school but I definitely felt the pull to follow it with my gaze, no matter what I was supposed to be doing. I felt like an oddball, one who didn't want to participate in the "normal" (boring) world of kids my age who could talk sports or tv, for example. As an adult I appreciate my mother's gifts: fresh grown greens from our garden, names for wildflowers, trees, insects, and always, always time for the birds. We would sit on the rooftop together, calling birds we could mimic like cardinals, mourning doves and robins. We always delighted in their response, especially when they'd fly closer to inspect where the sounds were coming from. She gave the world such meaning. She let us play in the rain, and in the mud. She let us wander out long after dark, knowing the mosquitoes would eventually chase us inside. Even now, a visit home is a visit to the land - I always take a walk, no matter the weather. I came to grips with the idea that my parents are not with me forever, when my mom's cancer returned recently. In remission now and stronger, but not to be taken for granted... I cling to every visit and try to make sure my kids get time on the hills and paths, in the pond and the gardens. Here, the best tasting apples, there, the spot to catch fireflies. Here, where we skated on the pond, there, where we'd catch tadpoles. I model my teaching on my many heroes: those who see the capable child and help children see both the wonder in the woods and in themselves. But truly it is my mom who was my first teacher, she who gave me all the names. It was my mom who helped me forge my own ecological identity, and my inspiring colleagues who helped me see the value in sharing it with the very young. It wasn't something to be spurned (as it seemed when I was in school) but something to be nurtured, our place in the world. Many years ago, a grade school teacher rather unkindly dubbed my best friend and I "Parrot" and "Wiggle Worm". Not yet double-digit in years, sitting quietly in a desk was beyond our reach - for her to sit in the desk was exhausting, so she'd climb over, crawl under, wobble sideways. Me? Never could keep a thought to myself, always the volcano mouth. Being shamed didn't help, for I couldn't stop myself. It did, however, make me feel embarrassed and unlikable. a time to learn all the names. 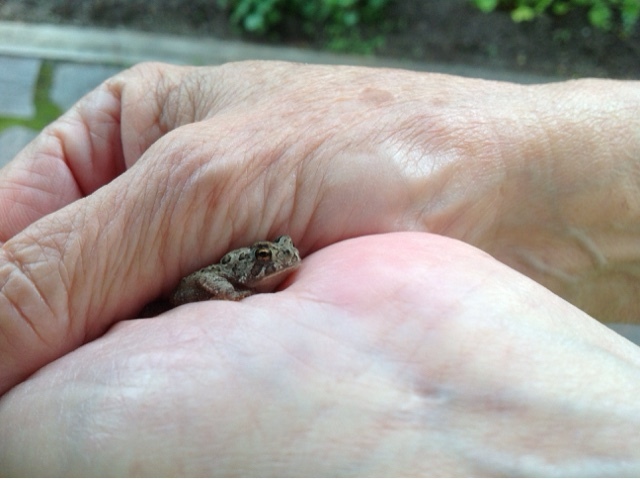 My mom cradles a tiny toad we found in the cool shade in the garden. That was all I had written in my notepad. I realize that my story ended rather abruptly, perhaps when I stopped to look out at the beautiful view of Lake Ontario that one so often sees on the Lakeshore West Go Train line, or when I picked up Ann's book to read again. It isn't an ending, merely a pause in the story that unfolds with each new affirmation, realization or connection made. Ann Pelo's book gave me the words "ecological identity" to help me frame what is most meaningful to me, but the journey of learning how it matters to my teaching practice continues. It was at the first "Reggio-Inspired Summer Intensive Course" that I began to tell my personal stories more freely, about my disconnect with people (though I felt deeply connected with the group who became known as the ever-growing #ReggioPLC) and the solace I found in nature. I see traces in my documentation of that realization. Like during my last two summers, this August I will take part in another weeklong #ReggioPLC summer intensive course, "The Rhythm of Learning in Nature", but this time it will be a wonderful meeting of Reggio-inspiration and ideas and practices from the Forest School movement. This summer I will also be in a different role, with my daughter along to share the joy of being in the forest. There will be time to learn the names... and time to listen.